'Grandmaster?Chu is a rare beast: a Chinese-American musician working in the capital. Todd Balazovic finds out what makes him tick. For most people lucky enough to have had an Ivy League education, moving to Beijing to become a rap star would probably not be their first choice. Then again, there are many areas where Jason "Grandmaster?Chu does not fit the normal stereotype of a rapper ?he grew up in a suburb of Delaware, attended Yale and never drink alcohol. But it is challenging stereotypes, specifically Asian-American stereotypes, that has earned Chu growing recognition in the underground hip hop scene in Beijing and the Asian-American community in the United States. Through his solo performances in Beijing and collaborations with friends in Los Angeles, Chu is pushing to bridge the gap between Chinese youth and their US counterparts. "There are three English letters everyone knows, ABC - American-born Chinese," Chu said. "But no one knows what it really means to be that person. "By bringing that conversation to both Beijing and the US, we are using hip hop to transcend the cultural gap." The 25-year-old rapper released his second solo mixtape, Yung Monk, in April and a collaboration disc, The Model Minority Report, with his LA-based group Model Minority in the US earlier this year. Recorded with two fellow Asian-American rappers, Inglish and D-One, The Model Minority Report, named after the stereotype that Asian-Americans are more hardworking compared with their Anglo counterparts, focuses on the challenges of living as a member of a minority in the US. Songs such as Overachiever give a humorous but telling look at a day in the life of a Chinese-American student featuring lyrics such as "Wake up, wake up it's 6 am on Monday morning, man/glasses or contacts, I don't know because I'm still snoring/mama got that congee pouring". For Chu's solo work in Beijing, the focus is more on philosophy and life in China's capital. "A lot of what I do is funnel the Chinese experience back to the US," he said. Chu first moved out to Beijing in 2007 after receiving a Harvard fellowship to study Mandarin. Initially, Chu said he had not planned on rapping in Beijing but a chance encounter with D-One launched him into Beijing's brewing hip hop scene and he was soon sharing stage time with some of the city's oldest MCs. "The hip hop scene was so rare back then, so we just started chopping it up," he said. 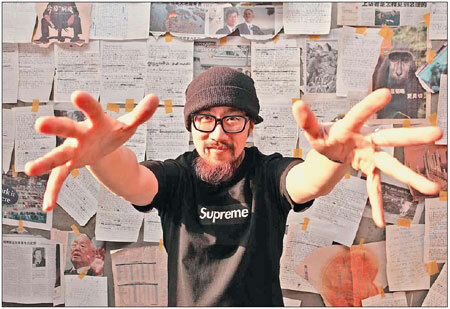 Meeting the founding members of Beijing's hip hop scene, hip-hoppers like MC Spazo, who played a crucial role in helping Chinese youth embrace the budding culture back in 2001, helped Chu develop into the artist he is today. "That's the difference between Beijing and back home," he said. "Here the scene is deep. You can still meet the OGs (original gangsters). In the US there are way too many people trying to do the same thing." Chu's interest in rap began while at high school in Delaware, after a friend introduced him to some of the less conventional hip hop music not played on the radio. Drawn by the intelligent lyrics and alternative beats he soon became a fan, and after discovering bands like Atmosphere, Sage Francis and M.O.P. he decided that rapping was something he could do. "It was hearing those guys, hearing that sound that turned me from a fan into an artist," he said. "I thought to myself, 'I know these words, I've got a bit of rhythm, I can do this'." 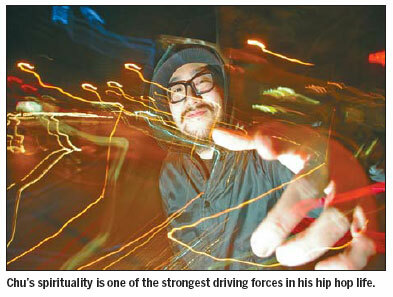 Though rarely exposed in his lyrics, Chu's spirituality is one of the strongest driving forces in his life. Working at the Beijing International Christian Fellowship during the week and spotlighting hip hop shows on the weekend, Chu said he's managed to keep the two separated while being true to both aspects of his personality. "I've never put myself out as a Christian rapper," he said. "Not because I'm ashamed or anything, I just don't want to get hooked in a niche. "I know this scene doesn't necessarily jibe with my background, but it's the music I love and as long as I stay real to myself I think other people will recognize that passion."